Two of the most common options for tapping into your property’s equity are home equity loans and home equity lines of credit (HELOCs). Both products are effectively loans that are secured by your property — meaning, if you don’t meet your payment obligations, you could lose your home. These two products are available through traditional lenders like banks and credit unions, and they often come with strict criteria of homeowners (HELOC requirements). While no two lenders analyze home equity loan and HELOC applications quite the same way, there are certain general guidelines you can count on to determine your eligibility, and some of the most common factors underwriters consider when reviewing applications are described below. By familiarizing yourself with the basic requirements for both traditional home equity loans and alternative products, you can find the best option for your needs. So… what are HELOC Requirements for a typical underwriter? Total HELOC Line = if you already have a HELOC in its draw period, this is the full amount that you could potentially pull from your HELOC. If your HELOC is in its repayment period, this is the current balance of your HELOC. Other Balances with Liens on Property = examples of other balances with liens on the property might include tax liens from the IRS or mechanic’s liens for contractors who have provided labor and supplies to the property. 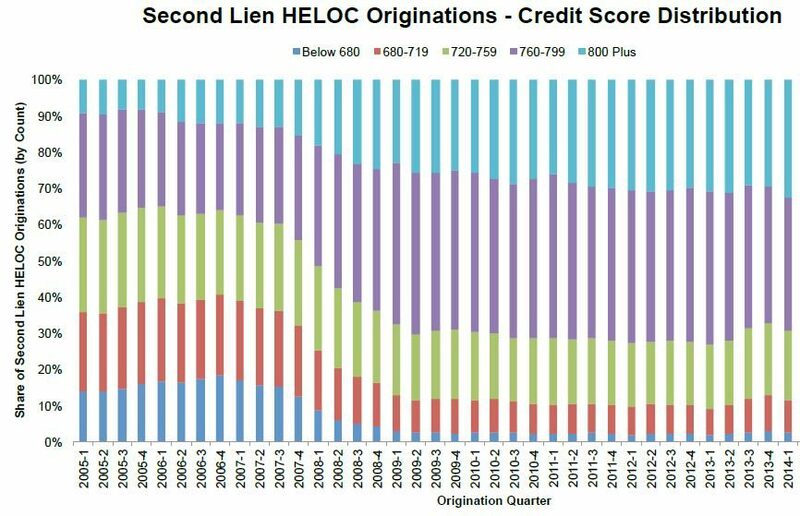 It is important to remember that when calculating your CLTV during the draw period for a HELOC, lenders will use the full credit line available to you with your HELOC so even the unused part of your HELOC balance will count toward CLTV calculations. Once you are out of the draw period, only the remaining balance will count toward your CLTV. Most lenders are not willing to take a third position lien on your property. So if you have an existing HELOC or home equity loan, the lender may require those positions be paid off using the funds from the new HELOC or home equity loan. For a quick automated computation, try using a CLTV calculator. To qualify for most home equity products, your CLTV should be less than 80%. Some lenders might offer products with CLTV caps at 90% or even 125% of the property value but these loans often have challenging qualifying criteria. Sometimes the term “credit score” is used interchangeably with FICO but FICO is really just one popular brand of credit score published by Fair Isaac COmpany. Experian, TransUnion and Equifax are the three major credit bureaus in the US and each publishes its own credit score based on data it collects from public and private financial institutions about consumer financial behavior. As most homeowners know, a “good” credit score is a prerequisite for many financial products; home equity loan and HELOC requirements are no different in this regard. While eligibility requirements vary significantly from institution to institution, it’s not uncommon for big banks to require credit score of 720 or higher of home equity borrowers. Other lenders may offer competitive rates for borrowers with a FICO score of 680 or higher. Since the 2008 financial crisis, lending standards have tightened a LOT — consequently, it has becomes very challenging for homeowners with a credit score below 680 to find lenders who will offer home equity financing. Point works with many homeowners with credit scores between 500 and 680 (and many more above 680 too). While high credit scores will put you in a lender’s good favor, another factor that will significantly improve your application is a low debt-to-income (DTI) ratio. Your DTI captures how much of your monthly gross income is committed to existing debt obligations. Lower DTI’s get the best pricing and the magic DTI HELOC requirements (i.e., the cutoff number) for traditional lenders is typically 45%, though some require an even lower DTI. What is the origin of that 45% cutoff? Well, it’s the number that Fannie Mae and Freddie Mac currently use in their loan insurance programs – homeowners with DTI’s above this level cannot be underwritten with Fannie Mae or Freddie Mac insured products. Even for non-insured products, it is common in the lending world to adopt the Fannie and Freddie standards as best practice. This means that if you earn $10,000 per month, and want to maintain a debt-to-income ratio of no more than 45%, your cumulative monthly debt obligations should be less than $4,500. Note that cumulative monthly debt obligations only includes debts – it’s the sum total of your monthly loan repayments (for example, mortgage payments, student loan payments, car payments) and does not include discretionary payments (even those which might not seem at all discretionary like your food expenses or phone bill!). Point works with many homeowners with DTIs above 45%. Point is an alternative to traditional lenders and looks at a more holistic picture when considering homeowner applications. We consider applicants with a wider range of credit scores, and are often able to work with applicants whose credit score does not meet the requirements of conventional lenders. Additionally, since many of our clients use their home equity funds to pay down debt, we look at DTI on the day of closing after you have received the Point funds, not on the date of the initial application. This allows our clients to use Point to bring down their DTI to below the 45% threshold that’s important for lenders. Additionally, the property may be the client’s primary or secondary residence, or even an investment property. Because Point uses both technology and real people to analyze homeowner applications, our process is intuitive, speedy, personalized, detailed, and transparent. Our approach allows for a broader range of homeowners to tap into their equity without having to navigate the complicated and rigid process of traditional bank lending. It’s easy to get started with Point. If you are interested in accessing your personal wealth, check to see if you qualify. It’s quick, easy, and doesn’t come with any type of commitment or strings attached. 1) Why can you get a car loan for $35k in about an hour w/ no collateral. Yet a home equity loan w/ collateral (your home) for the same $35k loan can take 4-8 weeks?? a) the MAJOR reason is that the price of the car is inflated… you get a really cheap auto loan rate because you haven’t haggled the dealer down to their “real” price. If you haggle hard, they won’t offer financing at the seemingly cheap rate — to establish the “real” rate, you’d need to find the gap between the price at which the lender will finance to you at the cheap rate and the price at which they will sell to you for 100% cash. Typically, you will see that, with pristine credit, the cost of the car loan is really 6-8% from the dealer.